Long before having kids, I dreamed of taking them on a humanitarian trip. I have always loved the idea of combining service with travel–two of my favorite things. This last January, that dream came true. 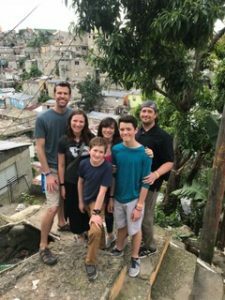 After months of thinking and planning, I found myself with my husband (who would rather enjoy the comforts of home), my two boys (who do their best to support me in my adventures), and my sister and her husband (who thrive on adventure like me) on the island of Hispaniola. Through a series of fortuitous events, that I can only describe as being divinely orchestrated, we had the chance to meet up with two of my dearest friends, Liz and Marisa, on both sides of the island. With their guidance, we became partners with our global sisters for a few life-changing days. Our time was filled with futbol games, late night dancing, and space to give these youth an opportunity to lead and gain confidence. On a Saturday afternoon, a number of these teens organized workshops for us. 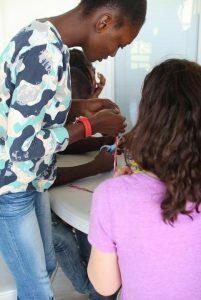 We rotated through these classes prepared for us in Haitian dancing, Creole, and bracelet making. 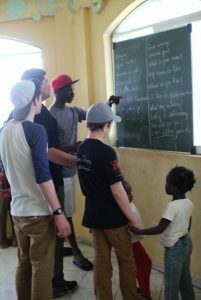 Language barriers notwithstanding, they owned this opportunity to lead us in learning something of their culture. After three too-short days in Haiti, with a longing to stay and connect more with these people we’d grown to love, we left Liz and took a quick flight with Marisa over to the other side of the island, the Dominican Republic. 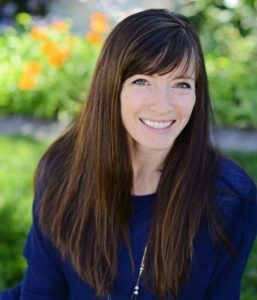 Marisa and her husband have lived there for the past year, working as volunteers within the community for Operation Underground Railroad. 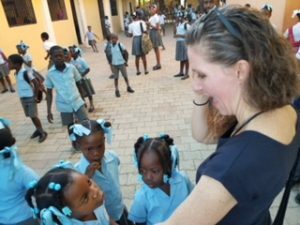 In the DR, we engaged with selfless nuns, resilient kids, and heroic men and women. 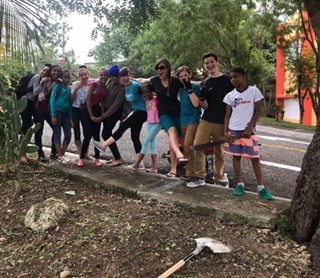 On one of the days, we worked with our global sisters at The Lily House. The moment I walked into that space, I sensed something very special. 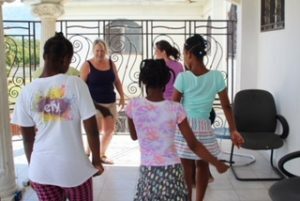 All of the women in that program have either left prostitution or have been rescued from human trafficking. They receive training and job skills and they are nourished by the good word of God. For privacy reasons, we weren’t allowed to take photos, but their faces are still fresh in my mind. Even though we interacted for only a few hours, I felt a deep connection with these women who are determined to rise above their past. They are overcoming incredible odds, and we were inspired by their fortitude. The next few days in the Dominican Republic were filled with more of these simple, yet profound moments of “showing up” and give-and-take. And I learned that it’s these simple moments of reaching out and working with people of different backgrounds and strengths, whether in your neighborhood or across the world, that build community and dissolve the boundaries that separate us. Incredible strength comes in just being present, because the vitality of our communities is found in human connection. If nothing else, let’s show up. **To support the women at The Lily House, check out their Etsy shop.